On to brighter topics and colors! 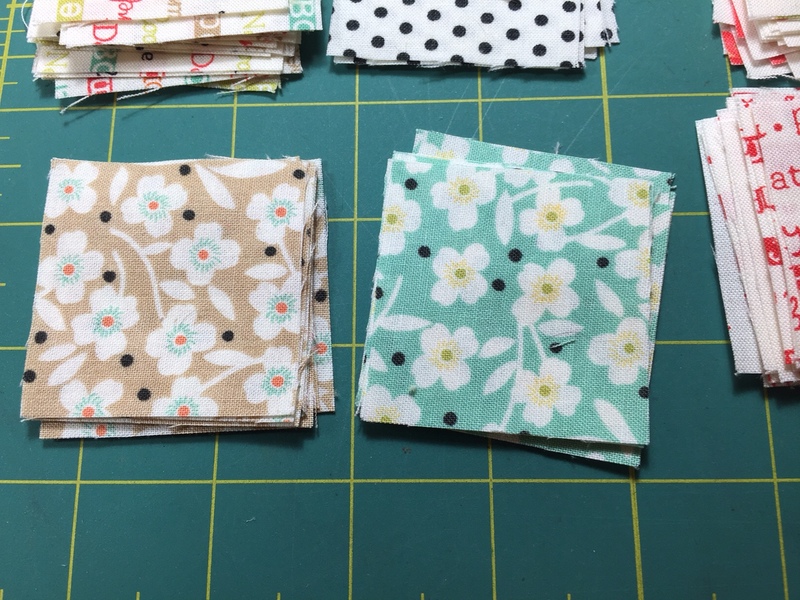 Last weekend I finally buckled down to get through my Snapshots sew-along blocks. Going to get them done before all of these 2016 BOMs get ramped up. 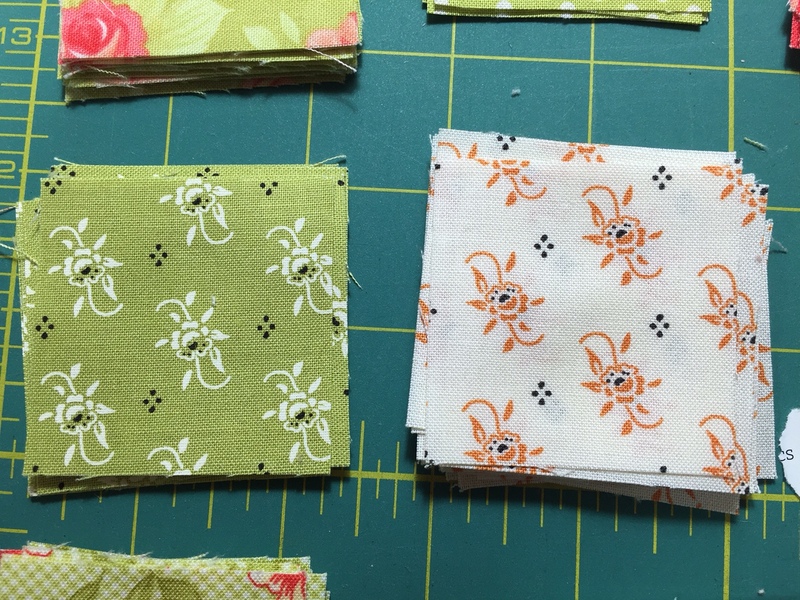 I plan to join in the Fat Quarter Shop Crossroads Charity Quilt-a-Long using the Fig Tree Quilts Strawberry Fields Revisited collection … but isn’t everyone?? 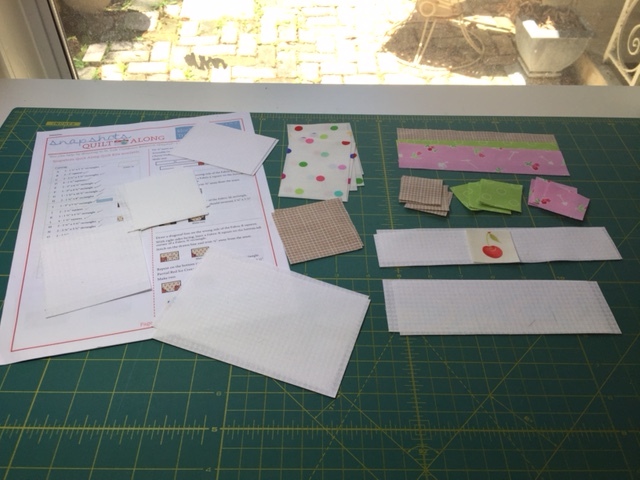 Also, based on some affection for other blogger posts – I felt ‘talked into’ joining the Kim Diehl Simple Whatnots Miniature Quilts monthly kits. The first one should arrive at my house today. This will be my first time participating in her program (also through Fat Quarter Shop). 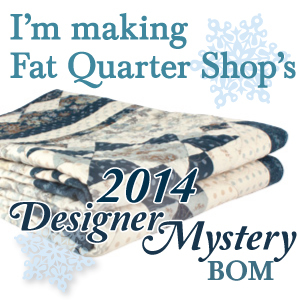 Then there is the Fig Tree Quilts 2016 Mystery Sampler BOM that should start in a month or two … and Midnight Clear BOM through FQS using a pattern by Sherri Falls from her upcoming book Holiday Wishes. 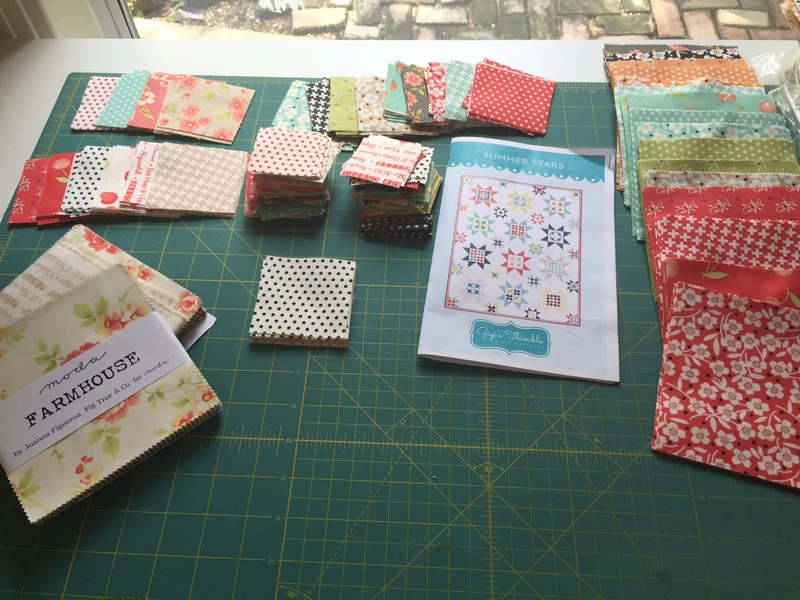 I’m also waiting on kits from the Vintage Picnic collection and I know I want to make something with “Little Ruby” – both of which come from Bonnie & Camille. So much great stuff this year!!! Baby girl is holding up the hot air balloon, which took longer than I thought it would to make. But quick enough regardless. Neighbor friend is holding up the bicycle block which I had stressed over starting because I thought it would take forever. It did take most of my day, in between watching some football and hanging out with the kids. Not too bad at all. Those tiny pinwheels! The sailboat block went together super quick. Cut and pieced it while the kids took their baths on Sunday night. I think … think … I am going to make the camera block instead of the car block for the front, and that would then only leave the picnic basket. Two blocks and I’ll be ready to start the sashing! I wanted to share this other rare picture. We feed a feral cat named “Ralph” on our porch each morning and we are owned by another black cat who lives inside with us. I think Ralph has started inviting his friends over now … can you see all 3 black cats? Black as night and as skittish as they can be. After about a month away from quilting, I started back up again this weekend. You see, my best friend, the one I mentioned in my last post, passed away in the middle of December. She was diagnosed with liver cancer on October 23 and died at her home, with her family, on December 14. It has been sad, surreal, heart breaking all at the same time. Other than my husband, Sabrena was my best friend who I had the pleasure of seeing every day at work. We met at work over 5 years ago and it took no time at all before we had our regular lunch dates to talk about family and work and movies and more family and all the stuff you talk about. We had our last conversation in the hospital before she got discharged under hospice care. I had no idea that would be the last time we would talk. The doctors said 2 – 8 months without treatment. She didn’t even make it 2 months with most of the time spent in the hospital. It isn’t fair and I’m not happy about it and I’m struggling with it every day, because I go to work every day. I started her quilt the weekend she told me her diagnosis. 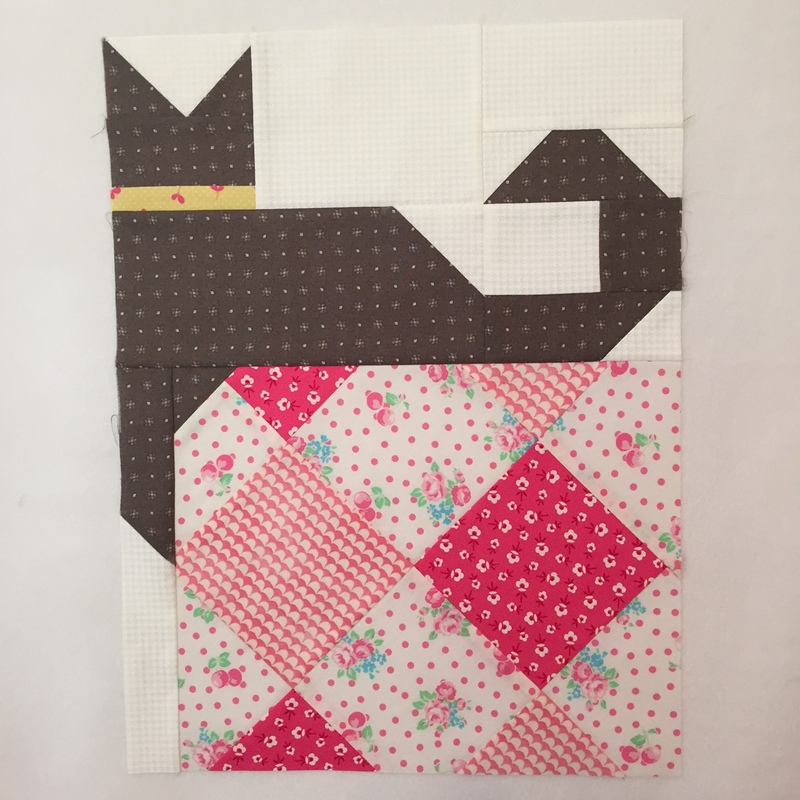 I had procrastinated on her quilt in particular, waiting for the perfect fabric collection or pattern. I jumped right in though with the beautiful romantic tones of the Rambling Rose fabrics by Sandy Gervais. I picked out the Rose Garden pattern for Sabrena. This is the last full quilt progress picture I took before I started adding on the applique items. At this time, I have the center applique done and the large bird in the corner. All I have left are the leaf appliques around the sides and adding a border all the way around to make it big enough for a roomy lap quilt. I think she would have loved it. But for now, it is folded up and tucked away for the moment. I’ll complete it at some point and give it to her husband. For me, if I make a quilt for someone in particular – it has to go to that person. I would even feel strange keeping it for myself. 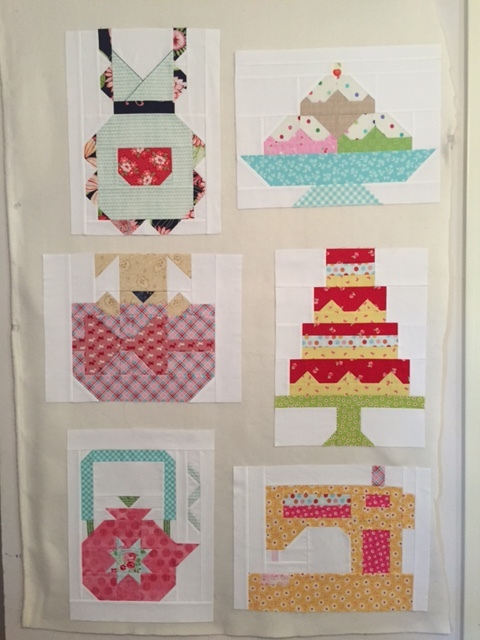 Instead of working on this quilt over the weekend, I put together 3 more blocks on the FQS Snapshots quilt. I have two more blocks to go and I’ll get started on the sashing. I’ll come back soon and show you those updates. 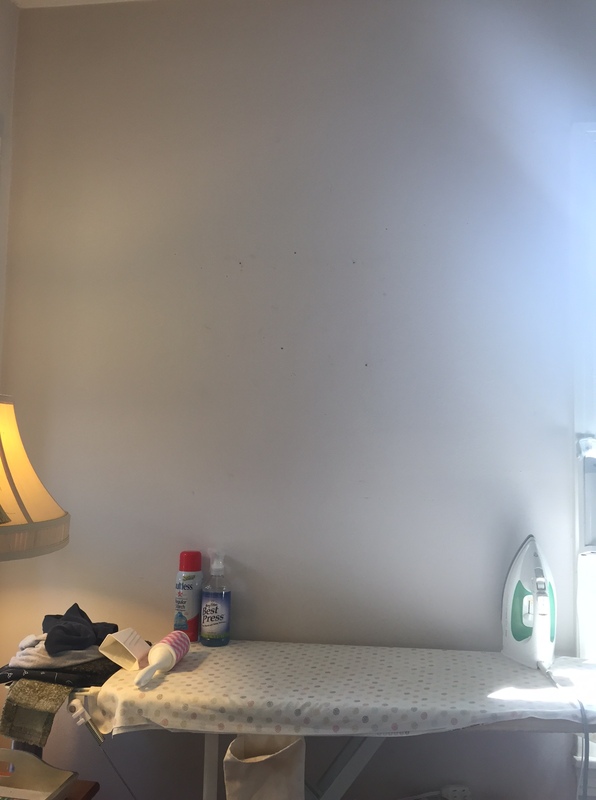 It will be more cheerful and bright – I promise. All my best to you. Thank you for visiting. Go hug your children, spouse, friends, parents, siblings, boss, cousins. Just do it. This year is flying by! Much too fast for my taste at the moment. Especially when I can actually sense when my kids have “grown up” a little since last week. Lots since the last post, just not a lot of time to sit and type up a blog entry. I appreciate that you stopped by – hopefully you will see something that interested you. Since the last post, many things have gone on around here. Long post with the pictures, but since I’m down to a single post per month – maybe you can persist with me? My company moved their office to a completely new building – all new construction and only one other company that moved in the same weekend as we did with three other floors vacant. We also had a huge yard sale, which wasn’t really worth the effort that we put into it. And Halloween came and went. Our cat is now as big as my daughter! During the same weekend, I was able to get a few hours in at the annual Quilt Festival. My husband was a great sport about it and went along with me. First time for Fat Quarter Shop to attend as a vendor and I was very excited to meet them in person! Love their new t-shirts – super soft! I also stumbled into the booth for Red Crinoline Quilts without realizing it. 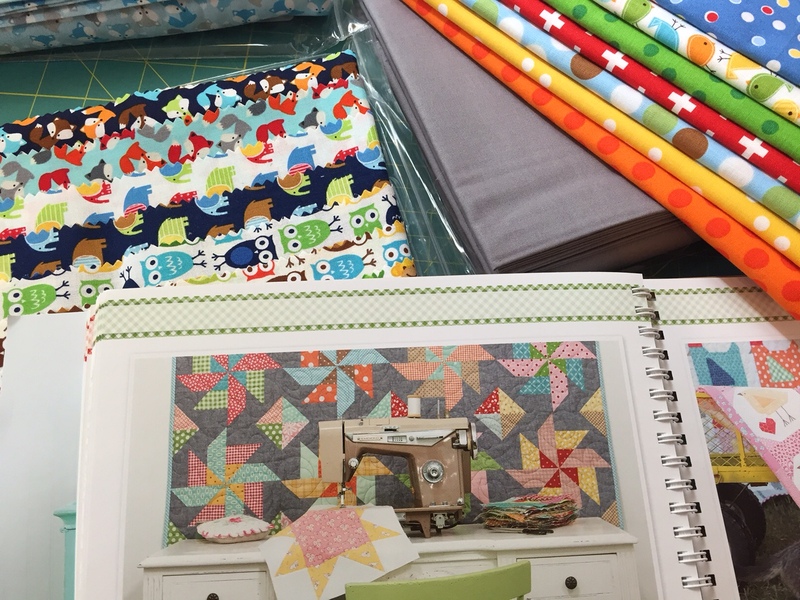 But I looked around and thought … “I know these quilts! Where am I?” Got some great photo ops with everyone! I finally put the binding on this quilt and wrote on a label, using one of the neutral block squares on the front of the quilt (which I did after taking this picture). Then, this past weekend, I decided to buckle down and start on a quilt for a dear friend. I thought about getting my Reach for the Stars done and gifting it to her, but I think she would really like something more colorful (but not too bright as she has told me). Dawn – you would be proud of me … I at least put on a couple of the inside containment borders, and I left my stuff out and available to get back on this ASAP. So – I went back to my original plan of Sandy Gervais patterns and fabric. I had selected the Fine China pattern with the Rambling Rose fabric collection to make for my friend. But, the quilt would end up being a huge 102″ square. And I need something a little faster. You see, my friend has been diagnosed with metastatic liver cancer which has already spread to her lungs and stomach. We are hopeful for the treatment therapy (oral chemo) to work a miracle for her. I am devastated by the impact of such a close friend going through this. I work with her every day and I just have no thoughts other than positive to keep her around. So, I took my fabrics for Fine China and am now going to make them into another Sandy Gervais pattern called Rose Garden. I think it will be a great fit for my friend’s personality and tastes. I grabbed this screen capture from Sandy Gervais’s website that shows the completed quilt. You can follow this link to see the pattern details and order directly from her site. You can see I’m using the same fabrics as she did, but I am planning on finishing it a bit different with an extra border in the aqua/rain color print on the left and top sides. I want it big enough to be a lap/couch quilt. So, it is a labor of love and I’m enjoying the soothing, romantic feel of the Rambling Rose fabric. I hope you are finding inspiration today in your projects as well. Thanks for stopping by and I hope to blog again soon! If you want to check in more often, you can follow me on instagram at jengwyn and I hashtag my posts with #seamscrazyquilts. I think I’m doing it right. Not entirely sure!! So, I finished this baby quilt over the weekend. I didn’t take the vacation days I expected when I planned my ‘two week challenge’. I’m going to take some days at the end of this month instead, with the intent to spend one full day at the annual International Quilt Festival! 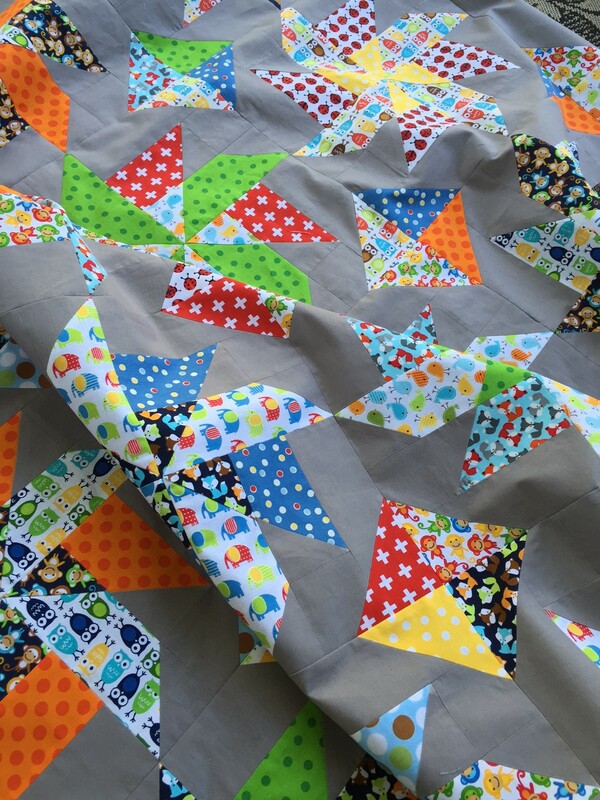 This baby quilt is made primarily with Urban Zoologie and Remix prints by Ann Kelle with a gray background by Riley Blake. 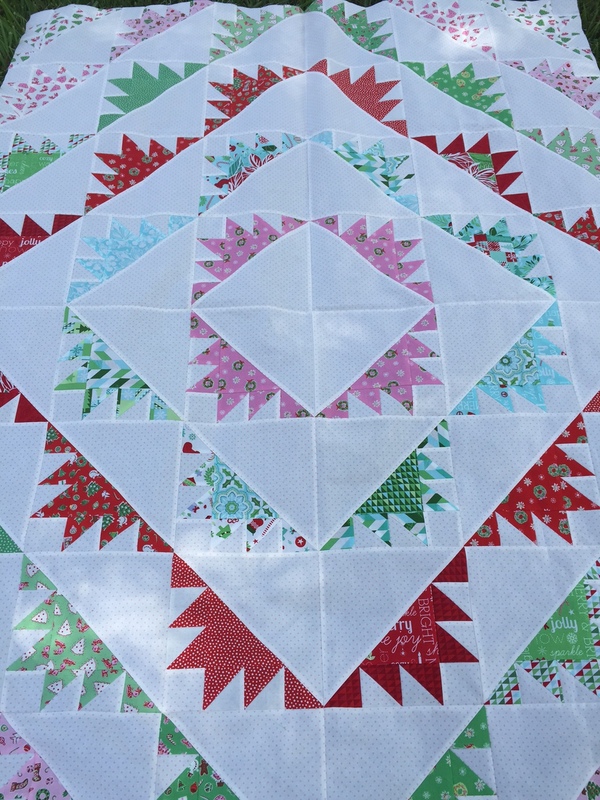 It will finish around 58″ square and uses the Tumbleweed block pattern by Lori Holt in her Farm Girl Vintage book. Here’s a little closeup. I want to quilt it myself, but I’m just not sure. I bought a plush minky fabric for the backing and I’m scared how hard it might be to quilt it without getting puckers and uneven results on my own. 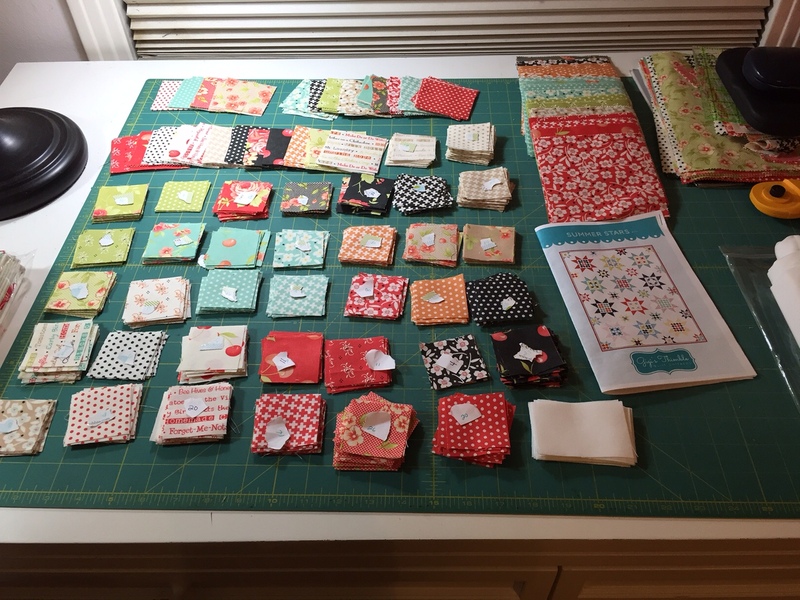 Since I still had some time available, and Houston Astros baseball to watch on TV… I went ahead and started cutting out fabrics for the 9th installment of the Snapshots Quiltalong, called Quilty Cat! 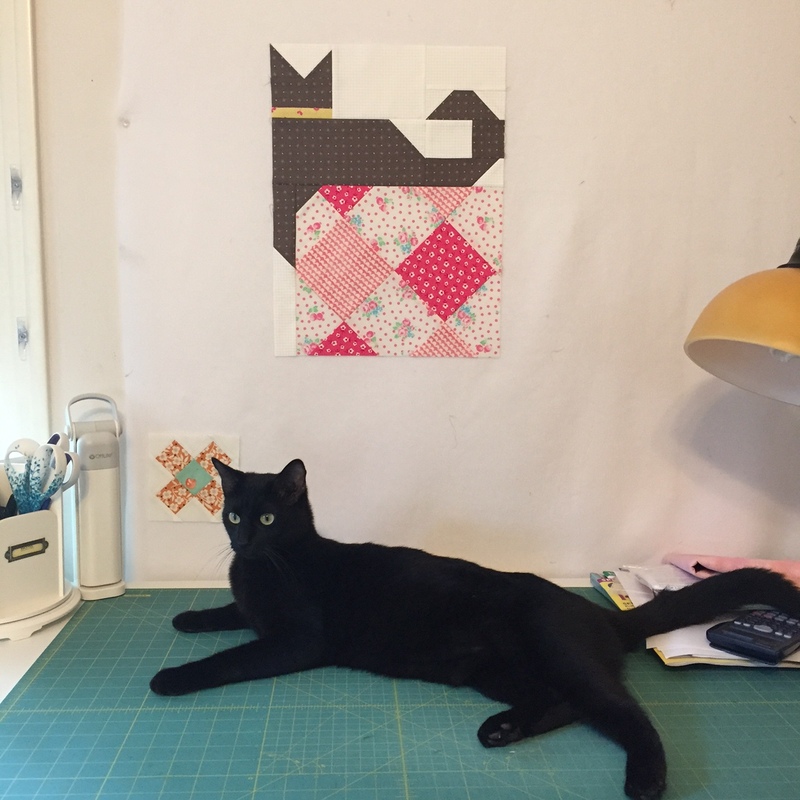 I wanted to replicate the look of our black cat, Violet – without making the cat pitch black in the quilt. I had this really pretty gray fat quarter that worked perfectly. Once I got started, I couldn’t stop. I had to finish it before I went to bed last night. Isn’t she cute? Now I just have to do the Hot Air Balloon and the Bicycle block to be caught up. The 10th installment gets released on Thursday however, so I’ll be down three by the weekend. But, for me, I’m doing really good to stay caught up this far (7 blocks out of 9). Hope you are all enjoying the changing of the seasons! I’m rooting for the Astros to win their Game 4 right now! Oh, it was hard to pack away this project. All my little piles neatly organized with their number count tag on top. I did make one, single mini block to get it started. Love the orange prints in this collection! But like I mentioned yesterday, I’m going to try and get a baby quilt done in 14 days. So I had to clean up! 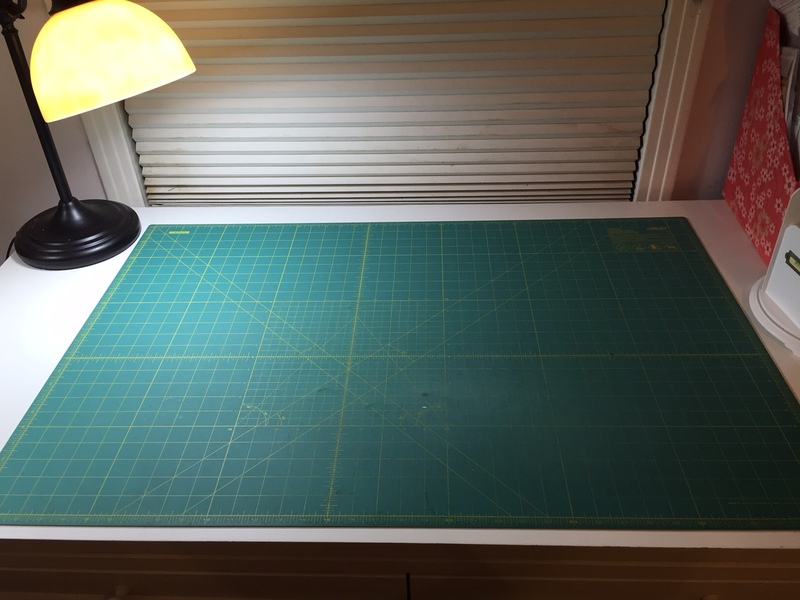 Ready to get sewing again… after doing all the math necessary to calculate the quilt top. Using a lot of bright colors and Mini Urban Zoology prints, along with others. I’ve chosen the Tumbleweed block from Lori Holts newest book, Farm Girl Vintage. I love the dark background in her picture below. I’m trying the same idea with this grey solid against all of these bright prints. Oh my, can there be no end of the list of quilts that we want to make? I think not. 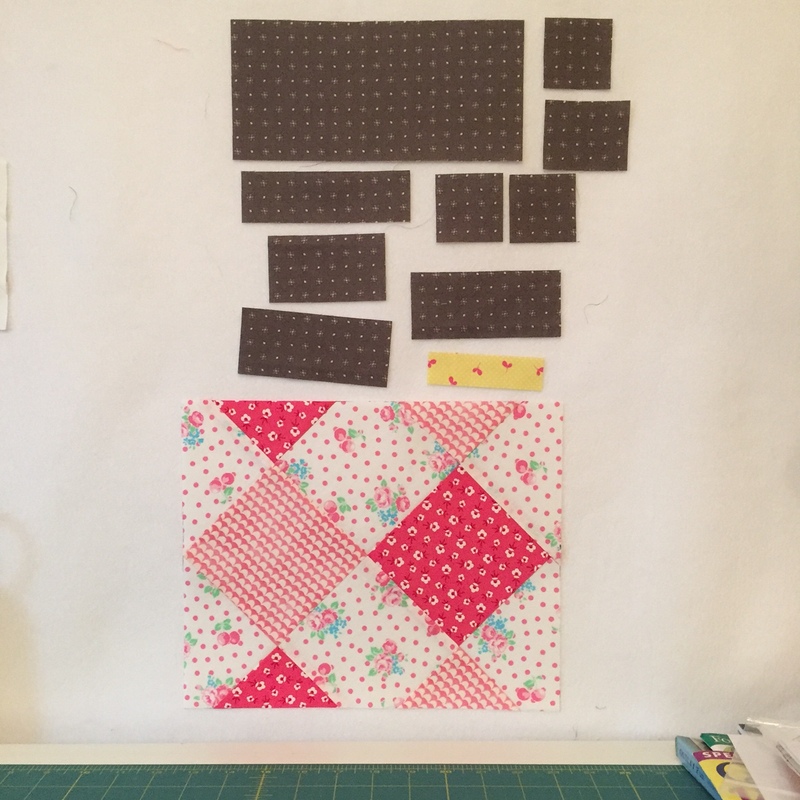 I have been cutting out my Farmhouse squares in preparation for the Summer Stars quilt pattern. I had bought one of those “Scrap Bags” that MODA puts out and was able to get a lot of good use from the strips. Most of them had enough width to cut 2 3/4″ squares that I needed in a variety of prints. For the rest, I certainly had no problem getting 2″ squares out of them to the rest of the length. I found out at the end that there were a few of the prints that didn’t make it to the Scrap Bag. 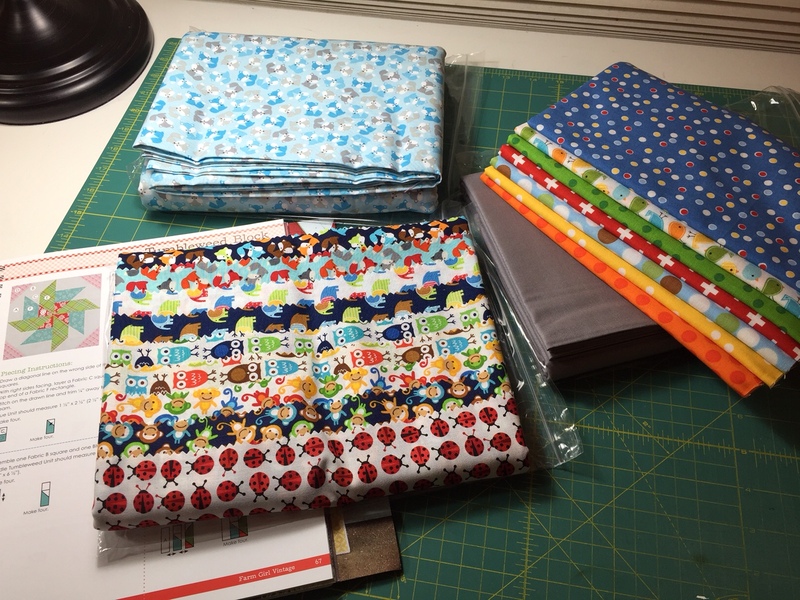 I took two layer cakes and got all the 5″ squares I needed for the project and then had plenty left over to get my sampling of more 2″ squares. I’m now moving on to cutting up the background required – using Bella White that matches really well. 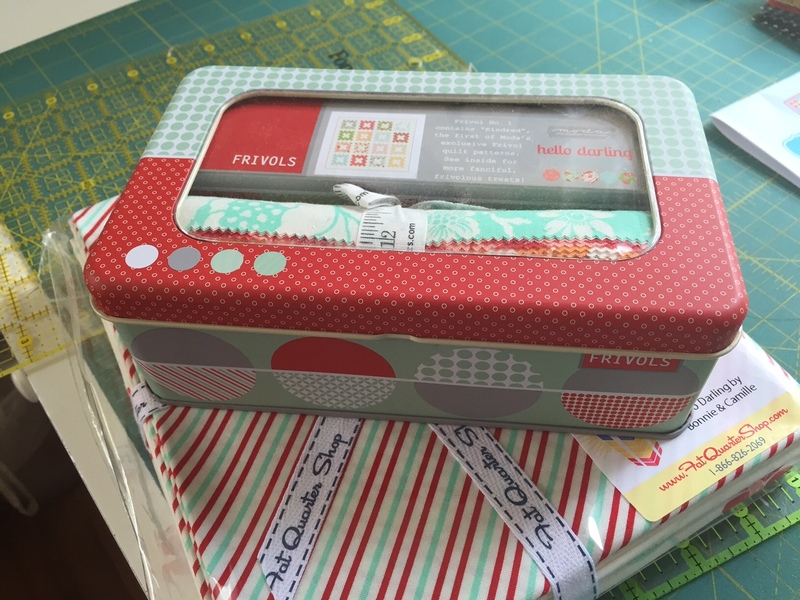 BUT… I also bought the first FRIVOL to be released. 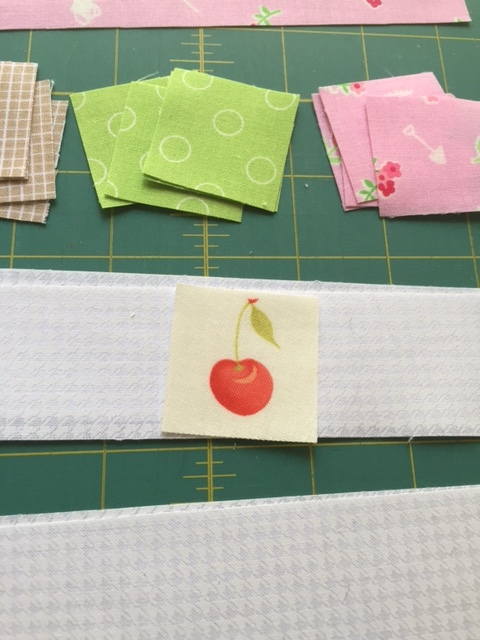 Adding to my growing stash of Hello Darling fabric precuts. You are paying for that cute tin and the pattern that I can figure out on my own, but I prefer it printed professionally. I also got the finishing kit from Fat Quarter Shop. I didn’t enroll in any monthly program. These items are pricey. I will pick and choose my favorite collections as we go along. I have another project I am going to start on tonight. 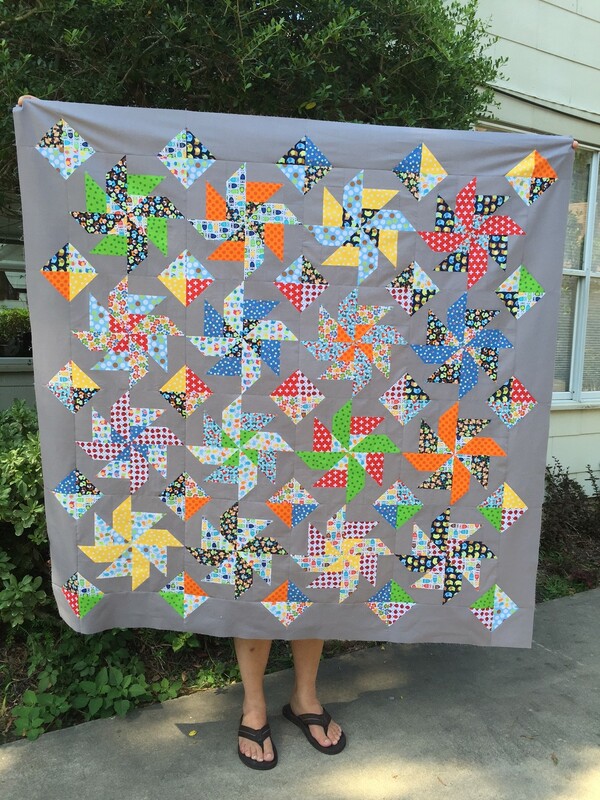 I’m going to see how quickly I can put together a pinwheel quilt for a new baby. I will be attending a reception for this newborn on Sept 10th. Let’s see if I can get it done! I’ll show pics as I go along… stay tuned! Moving on to Ice Cream! Well, Christmas is now back into storage for a few months. 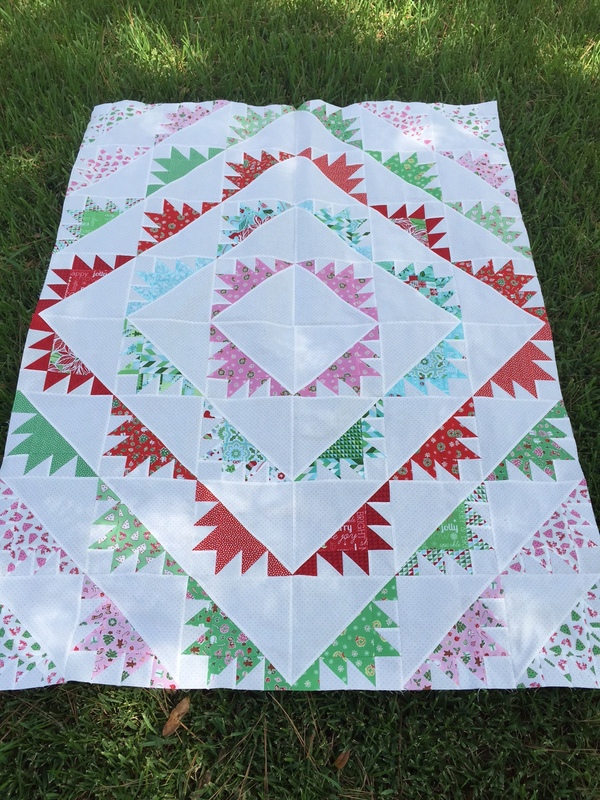 I finished up my Little Joys/Jingle quilt top, following the vintage inspired pattern from Fat Quarter Shop for the Delectable Mountains block. I haven’t decided about more borders. Although I made it to the specified “lap size”, I think my family has larger laps than the general population. Perhaps a border of scrappy random mountain peaks and valleys all the way around? I’m thinking…. Looks great against our green grass! Would love to find a matching light teal blue minky-style backing. I was already close to finishing this quilt top when the weekend came around, so on Saturday, I was able to cut out my pieces for Block 6 of the Snapshots Quiltalong. 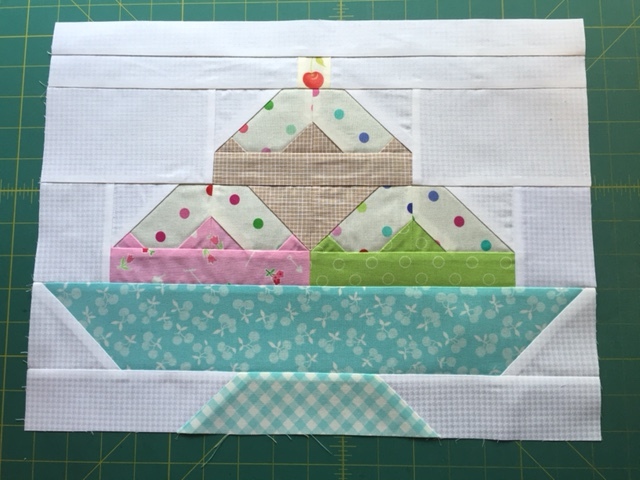 Last month was the Ice Cream sundae block! I love ice cream!! 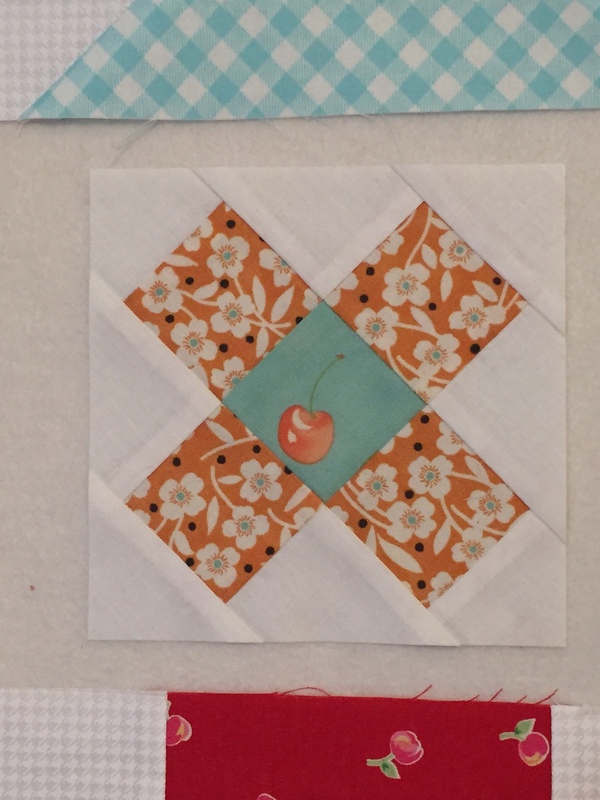 And I pulled out one charm square from my Farmhouse charm pack and used it for the Cherry on Top. Perfect! The sewing took no time at all, and soon my block was finished. I went with milk chocolate, strawberry and whatever would be a green flavor for my sundae. Whipped topping with sprinkles courtesy of Sunrise Studios. Other fabric from Fog City Kitty and Modern Minis. Can you spot my error? I think it is better for it. My green/mint ice cream has the sprinkled whipped topping melting further down the right side. Finally – a splurge purchase from Amazon.com at only $15 (tax included). 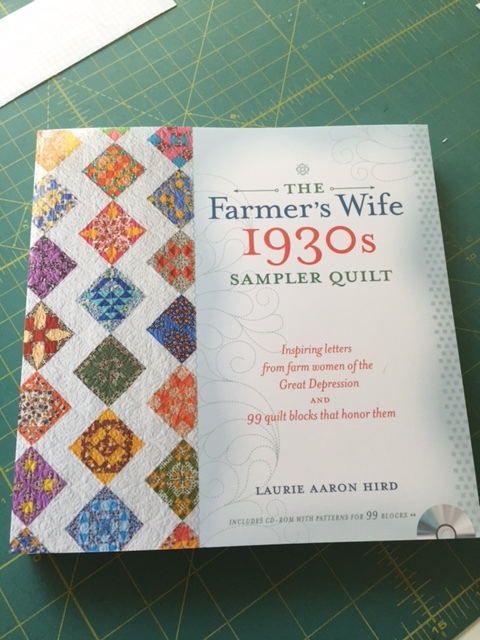 The Farmer’s Wife 1930s Sampler Quilt book. I have the other one, and I haven’t done anything with it yet. I love looking through the pictures though. I hope you are having a great start to the week. Ours will finish with the kids back at school and summer officially over.